One-in-five Americans are expected to be 65 and older by mid-century, and this could be a problem for the country. There is worry that government and household finances may be pushed to the brink by rising pension and health care expenditures. Economic growth, we are warned, might suffer with fewer workers and more retirees. But what does the public think? It may come as a surprise that the American public is pretty optimistic. In a Pew Research Center survey, only about one-in-four Americans say the growing number of older people is a major problem for the country, nearly two-thirds are confident they will have an adequate standard of living in their old age, and almost one-half say that individuals are primarily responsible for their own economic well-being as they get older. These opinions differ sharply from public opinion in most of the 20 other countries that we surveyed. Americans are among the least likely to view aging as a major problem; they are more confident than most of their old-age economic well-being; and they are one of few to express in plurality that individuals are primarily responsible for their own well-being in old age. Why are Americans so confident? And is there a gap between demographic reality and U.S. public opinion? It is hard to be sure, but the views of the American public are consistent with demographic projections. On two major counts—population growth and population aging—the future for the U.S. is robust compared with other countries. Take population growth. Yes, the U.S. population is expected to grow more slowly in the future—at 0.6% annually from 2010 to 2050 compared with 1.1% annually from 1950 to 2010. But this still amounts to an addition of 89 million people, among the largest gains globally. And the U.S. population should grow much faster than the populations of its major partners (or rivals), such as Germany, Britain, Japan, South Korea and China. Americans may have another reason to feel more confident than others about their demographic future: the U.S. is aging at a comparatively slow pace. The median age in the U.S. is expected to increase from 37 in 2010 to 41 in 2050. Meanwhile, a greater increaseis expected globally, from 29 to 36, and most people in South Korea, Japan and Germany are expected to be older than 50 by mid-century. But the U.S. population is still aging, right? Does that raise no concerns? It is possible the public has heard the alarm bell but believes that corrections will be made. Although it is difficult to anticipate the choices individuals might make in the future, Americans may plan to boost their retirement savings. And family structures may be evolving to adapt to the needs of the elderly, perhaps through growing numbers ofmulti-generational households. The future state of public expenditures also need not be gloomy. The principal driver of health care expenditures is cost inflation and reining that would significantly brighten the long-run outlook for Medicare and Medicaid. The Congressional Budget Office has alsoestimated that gradually raising the full retirement age for Social Security to 70 for people born in 1973 or later (it is currently at 67 for people born in 1960 or later) would reduce federal outlays on the program. When it comes to the workforce, the elderly are already showing signs of greater activity. The labor force participation rate among those 65 and older has nearly doubled since 1985. With people living longer and healthier lives, we may continue to see more elderly workers choosing to delay retirement in the coming decades. Economists have also noted that modest gains in productivity, through innovation, capital investment or a more educated workforce, may counter the effects of an aging workforce. Immigration may also be used to boost the size of the workforce. All this is not to say that population aging presents no challenges. A recent report from the National Academy of Sciences posits that “Population aging will have profound fiscal effects as well as effects on the broader economy.” But the same study concludes that “[aging does not present]…insurmountable challenges for the United States…An aging society need not have lower living standards, slower growth in innovation and productivity, or inefficiently high tax rates.” The American public, for now, is a believer in the positive. In a country where a one-child policy and an aging population prevail, the traditional family is being turned on its head. China is a rapidly developing country that is improving its economic position by sending more of their children to universities, even abroad. However, as the money starts to come in, dependents of the “little-prince” generation are wondering if their kid will ever come back home to take care of them. Recently, the “Law of Protection of Rights and Interests of the Aged” was established in an effort to make sure that kids are not turning their back on their parents. A social necessity or infringement of human rights? What do you think? Story Via: New Chinese law: Visit your parents – CNN.com. In China, visit parents or face jail? Hong Kong (CNN) — Lola Wang, a 28-year-old marketing officer in Shanghai, makes a six-hour trip to Shandong to see her parents twice a year — once during the Lunar New Year and again during the National Day holiday in October. “I feel like I should visit my parents more but having a job in the financial industry means I have to work long hours and sacrifice some of my personal time for work,” Wang, an only child, tells CNN. Wang’s dilemma is faced by many young people in China, where a one-child policy and three decades of economic reforms have accelerated the decline of the traditional extended family. It’s also a matter of concern for China’s new leaders as they grapple with the burden of supporting the growing number of elderly people. A new national law introduced this week requires the offspring of parents older than 60 to visit their parents “frequently” and make sure their financial and spiritual needs are met. “People are accusing young people of not visiting their parents enough,” says Wang, adding she agrees with the aims of the law. 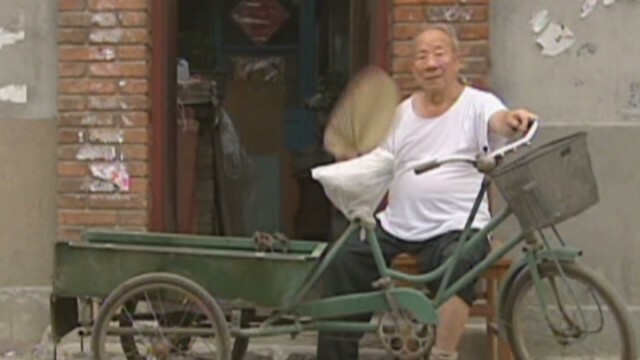 According to Xinhua, China had about 185 million people above the age of 60 at the end of 2011. The figure is expected to surge to 221 million in 2015 and by 2050 a third of China’s population will be classed as elderly. The “Law of Protection of Rights and Interests of the Aged” was amended by China’s legislature in December after a spate of reports about elderly parents neglected by their children. In one particularly horrific case in Jiangsu province, a local television station reported that a farmer had kept his 100-year-old mother in a pigsty with a 440lb sow. Chen Shoutian told the station his mother had been happy to live there: “She wants to stay here because she feels it is convenient,” he said. A modest pension and social welfare system, particularly in rural areas, means elderly people are usually dependent on their children for support. More than a fifth live below the poverty line, according to figures from the National School of Development at Peking University. Although respect for the elderly is still deeply engrained in Chinese society, traditional values like filial piety have been weakened by the country’s rush to modernity. “The traditional family support system is eroding for many reasons and I think the government would like to slow this process down,” said Albert Park, the director of the Emerging Markets Institute at the Hong Kong University of Science and Technology. The law stipulates that children cannot give up their inheritance rights in attempt to evade their duty to take care of their parents. It adds that children should pay a monthly allowance to their parents if they refuse to take care of them. The legislation also allows for the elderly to sue their children but does not specify the process or what penalties they might face. It may also prove difficult to enforce, says Ding Yiyuan from Beijing Yingke Law Firm. He told the Guangzhou Daily newspaper the law fails to qualify the word “frequently.” He added that few elderly people were likely to sue their own children. The law’s introduction has proved controversial. Some say it puts too much pressure on those who move away from home for work, study or other opportunities. He hopes his daughter will head to a big city like Shanghai or Beijing to find a job on graduation and not return to the small town where she grew up. “I don’t want my daughter to have a burden both physically and spiritually,” he told CNN.